Meet Stacy Rodgers, one of our 2018 LEAP finalists and a featured artist in The Store from October to December! Rodgers’ work explores the anatomy of life forms. 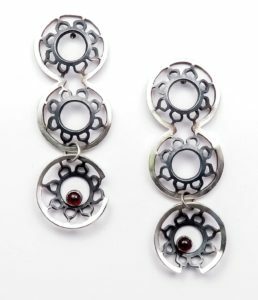 She simplified the lines, recess, and shapes of human body and other natural forms like microscopic organism and plants, into meticulously hand-pierced metal designs and jewelry. 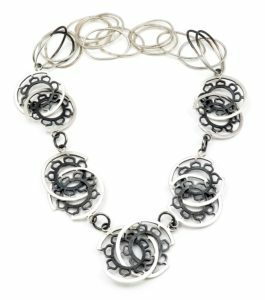 Rodgers ‘s work has appeared in a number of fine art jewelry galleries and craft centers around the country. 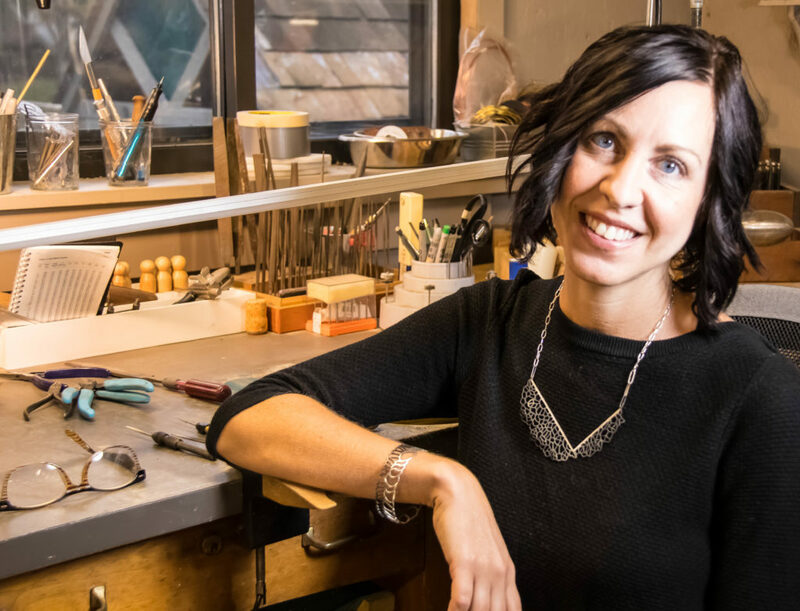 Her most recent award was as the Second Place Winner of the Halsted Design Challenge: Hidden at the Society of North American Goldsmith and the Juror’s Merit Award at Three Rivers Arts Festival in Pittsburgh, PA. Read on to learn more about Rodgers and her creative process. Stop by The Store to try on her beautiful and unique jewelry! I have always been fascinated with anatomy, because every line, every recess, every form of an organism has a strong refined purpose — to sustain life. The essence of my artistic voice is highlighting the explosive undulating lines and corresponding negative shapes within life forms across our world through hand-pierced metal. I’m focused on getting people to wear anatomy, not just the anatomy of our bodies, but also the anatomy from within a starfish, microscopic organism, or a tree. My work is a statement on the connection within all life that we take for granted or sometimes refuse to see at all. My education at the University of Kansas was focused on metalsmithing and jewelry design. I complimented those studies with a variety of classes in the sciences. I used the knowledge I gained in those classes on anatomy, astronomy, and natural history to influence the forms that dominate my work. The boundless possibilities of beauty and knowledge that lie within the arts and sciences feeds my work daily. I’m continually fascinated by the life cycle of the creative process in metalsmithing. Each step allows me to obsess over a new challenge in design, creation, and development of an object. Hand sawing a metal piece allows me to meditate. As each pierced area falls away the stress of life, money, family, etc. falls with it. Watching a piece slowly evolve through the process of hand fabrication is like witnessing a butterfly emerge from the chrysalis, its always a riveting experience and one I yearn to enjoy throughout my work. I’m inspired by anatomy and natural objects that have had an impact on my life. In college I was influenced by my body’s ability to develop life. From an egg cell to mammary glands I produced work that showcased the beauty within those objects. With the birth of my first son, I began to focus on the heart as my main inspiration. He was born with a heart defect that required surgery. After a trip to Hawaii with my husband for an anniversary I developed a collection based on the coral and shells we collected on the beaches of the big island. I would love to create an entire collection in elaborately hand-pierced and chased 18k gold based on forms found within the heart. Tell us about your favorite artist or artist that inspires you. Hanna Hedman. 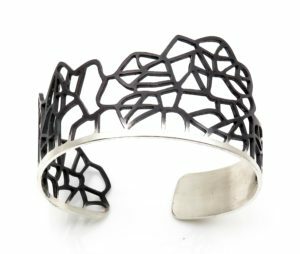 Hedman is a Swedish contemporary jewelry artist who creates organic, clustered forms draws from nature in its rawest form. Her work is full of texture and lines, and influences me to push the boundaries of what can inspire beautiful jewelry. The artist’s role in society is to expose the beauty that lies within the everyday. The artist allows people the chance to slow down, breathe, and enjoy the moment. Find your authentic voice, your unique artistic view point and push it to the extreme was some of the best advice I received as an artist. When you are unequivocally true to the work you are sending out into the world it will resonant with intensity to those viewing it. Every professor I had also talked about the importance of sketches, refined drawings, paper mock-up and copper samples. This is advice I try hard to implement with the creation of every piece. Trust yourself and believe in your voice. A unique viewpoint, hard work and a dedication to craft are the foundations to a strong artistic career. It is also important to learn from failures and rejections. They happen to every artist. 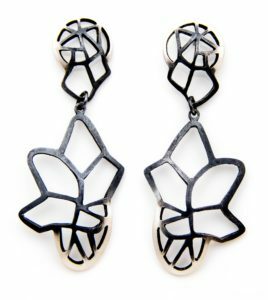 The LEAP Award has a long tradition of honoring emerging artists that go on to shape the dialogue of contemporary jewelry. I’m honored to be chosen as a finalist for the LEAP Award. This will help to elevate my work to a wider audience which will expose my practice to increased opportunities in terms of creating new work, developing partnerships with galleries and generating sales.